Employees at Associated Fire Protection recently donated toys, DVDs and arts & crafts for the children of Eva’s Village. 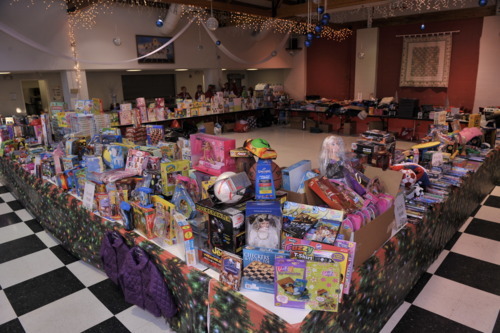 Each year Eva’s Village, with the help of volunteers, organizes the Holiday Shoppe at Eva’s Village. The Holiday Shoppe provides clients of Eva’s Village the opportunity to choose gifts for the their children at no charge. The Holiday Shoppe helps ensure that both the children and parents at Eva’s Village have a joyous holiday season. Eva’s Village is a non-profit organization whose mission is to feed the hungry, shelter the homeless, treat the addicted and provide free medical and dental care to the poor with respect for the human dignity of each individual. Eva’s Village is located in Paterson NJ, just blocks away from Associated Fire Protection, providing Associated Fire with an amazing opportunity to help the local community. Associated Fire Protection will continue to provide outreach to Eva’s Village in many different ways including organizing more days for employees to volunteer their time, continue with the food and clothing drives, and become active in Eva’s job preparedness program.